Cinq Mondes enjoys considerable international acclaim for its Spas that are ranked among the best in the world. Present in over 30 countries, the company has 14 own-brand Spas and a network of over 1,000 Partner Spas. Situated in prestigious locations in the heart of major cities or in the setting of luxurious hotels, Cinq Mondes’ 14 own-brand Spas are truly exceptional places dedicated to Wellness and Beauty offering the entire Cinq Mondes Treatment Menu. Their Spa-Therapists receive in-depth training in all Cinq Mondes’ Dermapuncture® techniques and treatments. The excellence of these establishments has been recognized through prestigious awards and accolades, such as the Spa-A Label approval and TripAdvisor® Certificate of Excellence. 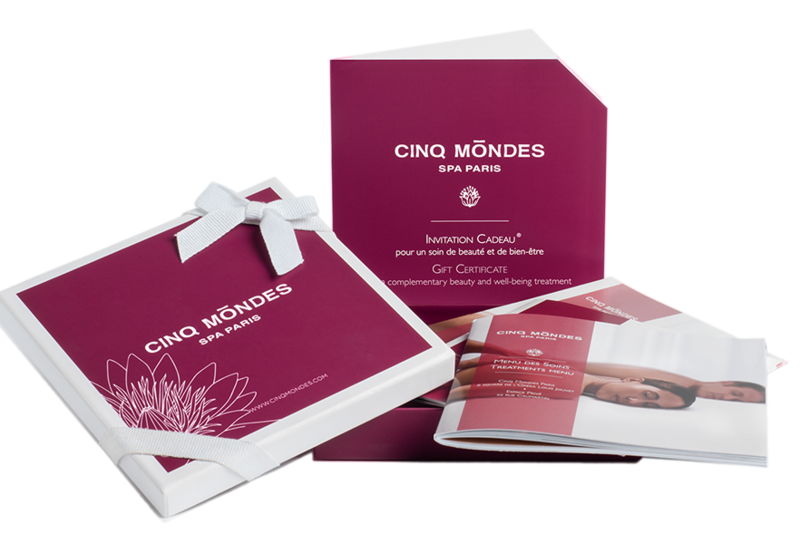 Buy or offer a treatment for a unique experience in one of our Cinq Mondes Spa Gift Certificates correspond to the duration of a treatment which can be freely chosen from among all the treatments of the same duration in the selected Cinq Mondes Spa. Cinq Mondes has a network of 500 Partner Spas in France and an additional 500 Partner Spas in over 30 countries around the world, including more than 150 located in outstanding 4- and 5-star hotels. These approved Partner Spas offer a broad selection of treatments given by Spa-Therapists trained in Cinq Mondes’ specific techniques and protocols.